When Mark Herring and I faced off in last year’s election, one of his common refrains was that he would “take the politics out of the AG’s office.” And who could object to that? While every elected official brings his or her own convictions and ideas to bear, we rightly expect much of the Attorney General’s job to come down to properly interpreting and applying the law, and defending the state’s interests even when (as is inevitable) the Attorney General may disagree with some of those laws. It didn’t take long for Herring to violate his pledge to take politics out of the office, or to do so repeatedly. The latest target of his highly partisan approach to the job? Virginia’s Photo ID law. Last year, the General Assembly enacted legislation requiring voters to show a valid form of photo identification (with provision for free IDs for anyone lacking one)— legislation supported by the vast majority of Virginians. Earlier this summer, with the support of the Attorney General’s office and without any opportunity for public comment, the State Board of Elections exceeded its regulatory authority by embracing the novel idea that “valid” IDs included those that were plainly invalid (expired IDs, etc.). When the State Board agreed to revisit its decision and consider an alternative definition of valid that comports with the plain meaning of the term, the Attorney General’s office stepped in with its ‘legal opinion’—to say that requiring IDs to be valid was unconstitutional! It’s all part of a disturbing pattern, already the norm in Washington and increasingly prevalent in Richmond, in which the executive branch blithely disregards or disingenuously reinterprets laws it doesn’t like. Now, there may be a case to be made that an expired driver’s license should be sufficient for voting purposes. That’s a matter that the General Assembly can take up for consideration. But the simple fact is that this is not what the General Assembly did. The Attorney General’s office argues, essentially, that since it’s not possible for an officer of election to identify every conceivable invalid ID—for instance, they can’t query the dmv database to ensure that a license wasn’t revoked—then, for equal protection purposes, they cannot make determinations about the validity of any ID. This goes far beyond the new photo ID law; it cuts deeply into prior laws regarding voter identification and sets the stage for further challenges to any ID requirement whatsoever, despite a string of court cases upholding laws like the one we have in Virginia. It is manifestly not the job of the Attorney General to manufacture challenges to laws he is sworn to defend. Wherever one stands on whether or not expired IDs should suffice for voting—there are fair arguments to be made on both sides, and amending the law on this point merits further consideration—we should all be alarmed by this wholesale rewriting of the statute on the basis of such a strained interpretation of the equal protection clause. Once again, Herring’s office has subordinated impartial legal analysis to the advancement of a political agenda, no matter how many contortions that requires. So much for taking the politics out of the Attorney General’s office. 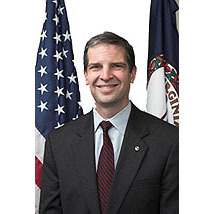 Mark Obenshain is a Harrisonburg state senator.